For over 40 years, African countries have been haemorrhaging more money than they receive in aid and foreign investment. 80 per cent of these illicit financial flows are siphoned through London, giving the lie to the idea that tax havens function independently. Over the last decade alone, $1 trillion of African money has been squirrelled away into secret jurisdictions, with the full knowledge of Western governments. Khadija Sharife has spent a year examining the Panama Papers and now reveals the inner workings of a monumental scandal. But the truth is not that simple: jurisdictions like Mauritius, much like Panama, British Virgin Islands, Cayman Islands and Bermuda are vulnerable and impoverished countries that are often coerced or incentivised by the “onshore” powers. These range from the financial muscle of multinationals including accounting and banking firms as well as the political prowess of the UK, US and Switzerland, wishing to maintain ring-fenced financial sectors. This is because the “offshore” is being used to facilitate activities that the better regulated “onshore” cannot do. No wonder, then, that the UK’s Serious Fraud Office (SFO) called the City of London a “head office” to the majority of the world’s tax havens that also comprise the UK’s foreign territories, including Anguilla, BVI, Channel Islands, Jersey and a dozen others. But the UK’s influence and reach is not limited to its own territories. From Hong Kong to Mauritius, the UK has played a critical role in the historical development of global tax havens that have “commercialised sovereignty” in exchange for a small fee. 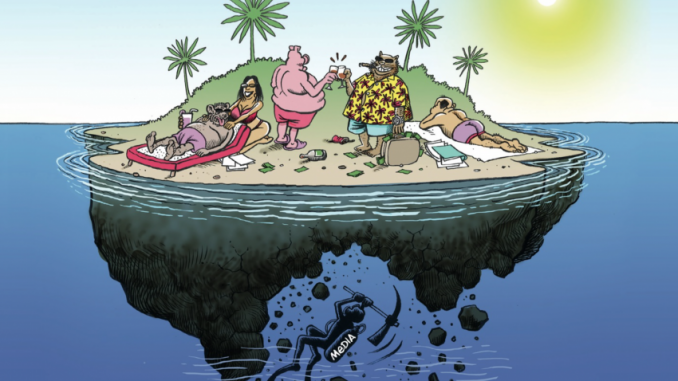 The myth of the offshore blankets the lethal truth of the matter: more than 80% of international finance activities are conducted through offshore financial markets indirectly or directly connected to UK secrecy jurisdictions. Generating more than 10% of its GDP from its ringfenced financial sector, Mauritius is renowned as both a “gateway” and “banking vault” for African and Indian capital – from wherever it comes. In fact, between 2000 and 2011, over 54% of India’s “foreign direct investment” came from Mauritius through a process called “roundtripping”: Indian capital is remitted to Mauritius before being remitted to India to qualify for various tax exemptions including capital gains tax. In 2010, I posed as a client eager to set up a Mauritian entity to avoid taxes from South Africa. I contacted a well-known offshore provider in Mauritius, Ocra, informing them that while my business generated significant profit, I didn’t like the political climate and sought a jurisdiction that would provide me with high levels of client confidentiality and low tax rates. My business, I declared, was selling very good egg cartons. “There is information-sharing only on money laundering and terrorist matters; otherwise, all information remains confidential,” said the kindly Ocra official. Though the official tax rate was 15%, I was told this could be reduced to zero if I opted for the legal form of Global Business Category II entity. The costs were minimal: bank account – $1,000; the fake (or nominee) directors – $1,200. Total fees for the first year? Less than $3,000. Best of all, I would never need to step foot in Mauritius. The identity documents required by Ocra and provided by myself could have belonged to anyone at all. But while Mauritius may serve as a gateway for capital flowing into and out of the African continent, not all “secrecy jurisdictions” are designed for the same purpose, nor do they work in competition. Rather, they perform specific functions – ranging from aviation and maritime services to mailbox companies and bearer shares, or even simply strategic geographic locations. Take Liberia’s maritime or “ship” registry: though the country barely has a decent port, the registry ranks as one of the world’s leading “flags of convenience” and hosts over 450 oil rigs active in countries like the US, Angola and Nigeria. By registering an oil rig in a tax haven, companies are able to elide financial, legal, environmental, labour and other regulatory requirements that would be imposed by the country where oil activity is occurring. Liberia’s registry, like those of other maritime tax havens including the Marshall Islands, is not managed by the government. The Organisation of Economic Cooperation and Development (OECD) claims that maritime companies seek “cloaking” services to make sure their activities and owners, are “almost impenetrable”. And the OECD says that when it comes to the registration of ships and rigs, anonymity is the “rule rather than the exception”. In fact, estimates suggest about 60% of the world’s vessels are “false-flagged”. This secrecy of these ship registries has also helped conceal corruption, as was the case of Charles Taylor in Liberia. What happens where a crisis occurs? In the case of the Deepwater Horizon oil rig spill in the Gulf of Mexico, the US government could not regulate what it did not know existed. Though BP leased the rig, it was owned by a company called Transocean which had registered the rig in the Marshall Islands. Transocean’s liability? Just $27 million. Dividends to Transocean shareholders for the same period were over $1 billion. Coincidentally, the maritime registry of the Marshall Islands was also managed by IRI. These perks have drawn in over 2,000 vessels keen to “flag” in a jurisdiction that asks no questions. A project by the African Network of Centers for Investigative Reporting (ANCIR) called the doubleoffshore.org revealed that more than 70% of Nigeria’s deepwater oil rigs are incorporated in tax havens. Though oil companies come under scrutiny, those ghost ships that also perform the function of human, drug, wildlife, timber and other criminal trafficking, do not. Not only do multinationals operate in criminal ways, but criminals camouflage themselves as multinationals for the same end: secrecy. Conveniently, the process of intra-company pricing, impacting 60% of global trade that occurs within different subsidiaries of the same multinational, not between different multinationals, has created a situation where global trade is essentially selfregulated. This is because national governments only regulate at national levels, not the transnational. Yet businesses operate across countries. The process of using foreign shell companies in numerous tax havens to create artificial costs, high interest loans, and false management and service fees is rampant. The International Accounting Standards Board (IASB), which determines the global financial reporting practice, says that multinationals don’t need to disclose disaggregated or granular information to national governments in annual reports. The financial reports, claimed the IASB to this author, are for investors only. This means that details relating to where taxes are paid, where profits are recorded, the names of linked companies and beneficiaries, and the extent of intracompany transfer pricing is held as confidential. No wonder the continent loses $150 billion each year. It may not seem obvious but the patterns of capital are still embedded in history: Most dominant political parties from Angola and Namibia to South Africa heavily relied on the offshore during anti-colonial struggles. In 1977, Jobo Holding S.A. was incorporated in the tax haven of Luxembourg via the Banque du Luxembourg’s (BDL) Compagnie Financière de Gestion (CFG) – a wholly owned subsidiary that handles sensitive business for wealthy clients. Among many other offshore structures, its purpose was to funnel cash to the Southwest African People’s Organisation (SWAPO), which was targeted by colonial forces that actively sought to deprive it of funds needed for the struggle. In peak years Jobo received as much as 160 million Luxembourg francs (LUF) – about $5 million. Not very much but certainly more than the “substantial amount” the Organisation of African Unity gave SWAPO – $450,000. The perks of using the CFG range from Luxembourg as a legal and financial secrecy banking vault, to the CFG’s generous private financial services. Internal documents show that the CFG not only acts as nominee directors and secretaries for companies seeking secrecy but will also, incredibly, list their own names as the beneficial owners. Or Portugal, a former colonial power in Mozambique, Angola and other parts of Lusophone Africa is frequently used by clients of African origin. A senior official in IBC said, “companies create monthly new entities all over the world through their Funchal representative offices. [By 2015] These trustees registered over 2,000 companies with African “roots”. There were different trustees listed by the source for specific countries – Namibia’s included known financial players active in Namibia such as Sanlam, Stanlib, Investec and others as well as non-Namibian entities based in Madeira. But while the focus is often on jurisdictions, these spaces are like “parking lots” rented for a short time by the intermediaries, including major banks and accounting firms, required to facilitate the process of moving capital and performing activities from behind the corporate veil. The details are often self-regulated with little in the way of investigation and the role of agent or fiduciary as buffer. But the details, whatever their veracity, must be logged in order to process paperwork. This is due diligence – a standard that is both exceedingly slow and extremely methodical. Put simply, the more tax havens, banks, and “offshore providers” like Mossack Fonseca that are involved, the more deniable the process becomes. This is because each player will obtain only enough information to pass due diligence. For example, a nominee shareholder qualifies as a shareholder, because the nominee bears the responsibility whether or not the nominee is aware of the real beneficial owner. It goes without saying that bank accounts do not need to be located in the jurisdiction where economic activities occur. But when a bank in a tax haven utilises a branch in another tax haven on the orders of a fiduciary that represents a shell company and so on, there is much room for concern. Yet this appears to be the norm. Such branches of major banks in tax havens are not legally required to share information with branches of the same bank based in non-tax haven jurisdictions. That is, companies can access the veneer of well-known international banks while eluding the regulation that is associated with its “onshore” branches. When Barclays Bank, for instance, requested Mossack Fonseca’s own organisational structure, a three-block image was provided. Barclays followed up requesting the name of the beneficial owners. MF responded, “Jurgen Mossack, Ramon Fonseca Mora and Christoph Zollinger.” Though undoubtedly true, Barclays will just have to take their word for it.